For the past ten years, Intel Computer Clubhouse has been hosting a biennial teen summit – and the 2012 event is happening now at Boston’s Northeastern University. This year’s summit includes 170 youth & 71 educators from locations around the world: Argentina, Jordan, India, Taiwan, New Zealand… The list goes on & on! This year’s theme is Design Your Future, Change Your World, and students have filled the Northeastern University campus with youth media & technology workshops, including topics such as designing video games or building robots. Yesterday featured the C2C sessions: “Clubhouse to College” or “Clubhouse to Career”, during which students had the opportunity to speak with a variety of college admissions counselors and industry specialists, who provided guidance and answered questions for students on how best to plan for their futures. 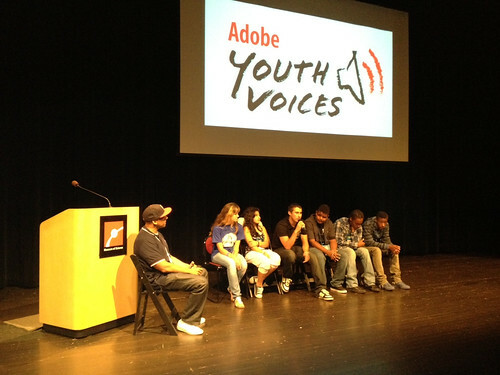 Many of the school sites represented are a part of the Adobe Youth Voices network, and last night AYV held an hour long film screening, followed by a panel discussion and Q&A session. Have fun, everyone, and enjoy the rest of the summit! What a wonderful cross cultural opportunity for youth to share together in creativity and innovation and congrats to the many clubhouse winners and participants in AVY!! Thanks Adobe for being a true supporter in one of the best youth programs in the world.